If you like diaries, especially The Dork Diaries, check out these upper-elementary and middle school titles filled with mischief, friendship, and BOYS! Amerlia has entered the eighth grade and boys, friends, and school dances become very important to her. Twelve-year old Mackenzie "Mac" Lowell accompanies her favorite boy band, Perfect Storm, on another road trip and chronicles her experiences on tour. Kiki and her best friends, Coco and Lulu, all live on Lotus Lane, attend Amber Acres Elementary School, and have their own club, so when a when a Japanese girl named Mika moves in next door and also chooses fashion design for her art project, Kiki is seriously annoyed. Ten-year-old Celie can tell her parents are keeping secrets, but she can't talk to her best friend Lula or her sister Jo, because they're both keeping secrets! Why is Lula not sharing with Celie? Once again Celie turns to her diary as she tries to sort this all out, filling the pages with heartfelt and often humorous entries, notes, drawings, and pages from her top-secret spy notebook. Doreen has vowed to make her new middle school work for her, but it is still a challenge given her ADHD, her younger sister is growing popularity, and tensions between her parents. Good thing Doreen has her doodle journal! 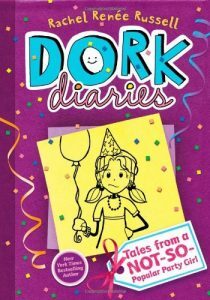 View more suggestions for The Dork Diaries.